With its marvellous ragged crater, Altar is one of the most spectacular volcanoes of the Ecuadorian Andes. Its original name, Capac Urcu means "mighty mountain" and according to vernacular myths it was bigger than Chimborazo but remained smaller after a huge eruption that formed the crater. Altar is located in the Sangay National Park and lies not so far from Riobamba. It has an array of lakes with different water colours, ranging from yellow to turquis blue. During this trek we will hike close to these lakes and get the most amazing glimpses of this extinct volcano. Ragged peaks of the Altar caldera. Spectacular views of Altar and Chimborazo. Walking hours: 6-7 per day. Luggage: Carried by pack animals on first and last day since we use one fixed campsite. Suggested period: Mid September to mid January. Grade: Moderate to challenging (depending on weather conditions). 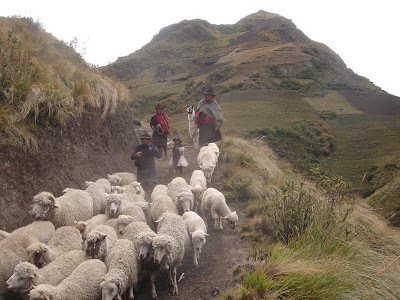 Although this is a moderate trek, it could be very hard if you are not properly acclimatized. Be ready to walk on trails as well as on cross-country terrain, wet paths and through mountain forests. Do not expect to find well marked trails. You also need to be in a good physical shape and mentally prepared for it.